We are very lucky to have a dog-friendly office here at StockdaleMartin. Our office dog, Della, always makes our days better and our meetings more relaxed. Studies have shown that dogs can make a positive difference in the workplace. Pets around the office can be a great bonus for employees’ mental wellbeing – stroking and petting is one of the best forms of stress relief. A dog’s enthusiasm can be contagious and simply spending time with them leaves people feeling more relaxed and more optimistic. Feeling more relaxed surely helps boost productivity and makes people feel happier and more likely to perform at their peak but a pet at work can also help people cope better with pressure. The benefits are immeasurable, simply looking at that puppy smile brightens up the day. Studies also show pets in the office setting increase employees’ loyalty and job satisfaction. It gives people a chance to step away and take a “breather”, contributing to a healthy work-life balance. Anyone who walks a dog in the local park knows how people make connections through their pets, and the same happens in the workplace. 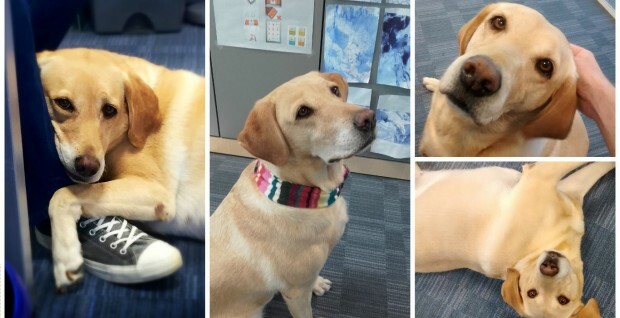 Having animals at work can help to make connections among employees and nurtures a sense of community, increasing cooperation and leading to a positive workplace. Do you have any pets at work? Would you like to? Let us know. And in the meantime why not enjoy a few photos of Della having a good time at StockdaleMartin.